Featured as NASA´s Astronomy Picture of the Day (APOD). PT | EN During a climb to the highest mountain of Portugal (2351m) – Pico mountain, located in Pico island, Azores – with a very hard weather conditions due to a strong winds and rain during almost the entire photo expedition with my team colleagues, I stopped at about 1200 meters to appreciate the views and photograph the lights coming from the island of Faial in the middle of the Atlantic Ocean, in a rare occasion with only a few clouds and part of the “winter” Milky Way visible as a background of a temporarily clear sky. Above the low clouds, I have captured strange “rainbow bands” of airglow and between them, the Andromeda Galaxy M31 on the top left of the picture. The air glows all of the time, but it is usually hard to see. A disturbance however – like an approaching storm – may cause noticeable rippling in the Earth’s atmosphere. The bands are actually huge parallel structures in the thermosphere 90 km upwards. Perspective makes them appear to converge. These atmospheric Gravity Waves* (not confound with gravitational waves related to Einstein) propagating upwards from disturbances lower down in the atmosphere, are likely the source of the bands. The wave amplitude increases with height (reducing density) and wavelengths can be thousands of kilometers. Dr. Martin Setvák from Czech Hydrometeorological Institute Satellite Department, Praha, Czech Republic, has processed the Suomi-NPP VIIRS data to check if these gravity waves in airglow can be found in NOAA/NASA Soumi-NPP satellite Day/Night Band (DNB) image. The “day-night band,” of the Visible Infrared Imaging Radiometer Suite (VIIRS) on the Suomi NPP satellite has indeed captured these glowing ripples in the night sky. The day-night band detects lights over a range of wavelengths from green to near-infrared and uses highly sensitive electronics to observe low light signals. The structures of the bands can be seen below, above the Pico and Faial islands in Azores, Portugal. Airglow is a layer of nighttime light emissions caused by chemical reactions, light of electronically and/or vibration-rotationally excited atoms and molecules high in Earth’s atmosphere, by solar ultra-violet radiation. A variety of reactions involving oxygen, sodium, ozone, and nitrogen result in the production of a very faint amount of light. In fact, it’s approximately one billion times fainter than sunlight. Technically speaking, airglow occurs at all times. During the day it is called “dayglow,” at twilight “twilightglow,” and at night “nightglow”. There are slightly different processes taking place in each case, but in the image above the source of light is nightglow or airglow. 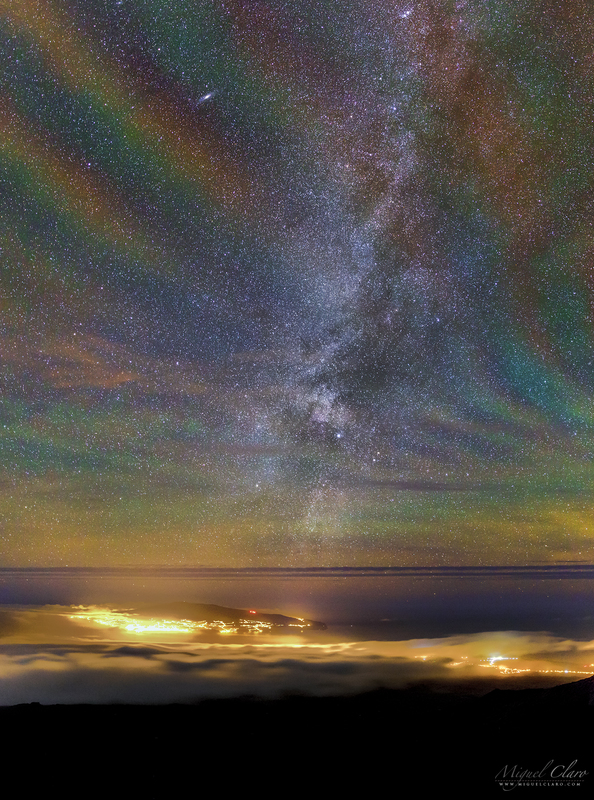 In the first colorful image captured above Pico, we can see a rare event where is distinguished almost each possible airglow color that is appearing on a single band (Gravity Wave) showed like a rainbow. 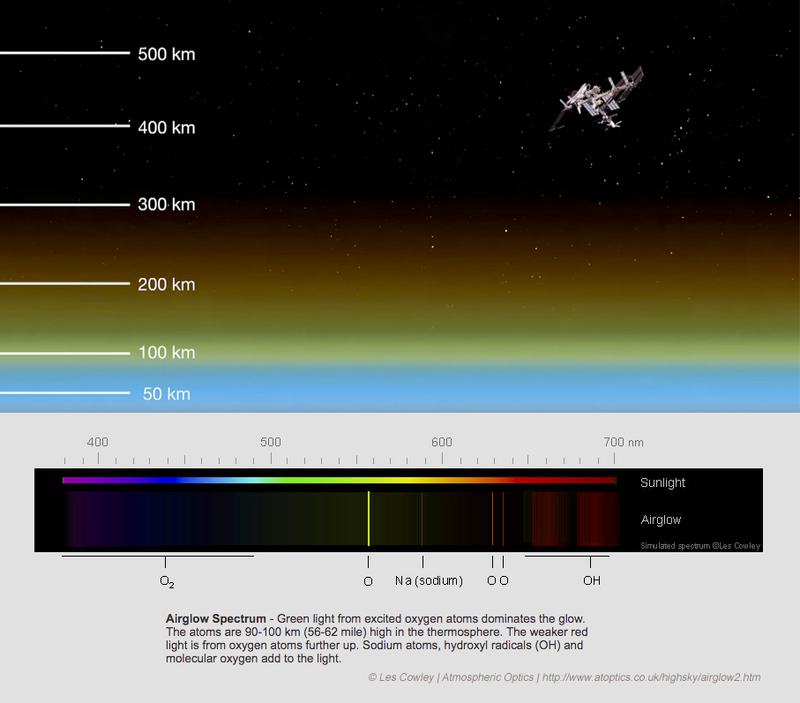 Below is the Airglow Spectrum designed and explained by the expert Dr. Les Cowley from Atmospheric Optics. Green light from excited oxygen atoms dominates the glow. The atoms are 90-100 km (56-62 mile) high in the thermosphere. The weaker red light is from oxygen atoms further up. Sodium atoms, hydroxyl radicals (OH) and molecular oxygen add to the light. Dr. Steve Smith, Senior Research Scientist at Center for Space Physics of Boston University, is a specialist in airglow and has explained the rare phenomenon captured on these images: “The photo is very other-worldly but it is indeed a photo of two, maybe three, airglow layers with gravity waves propagating through them in the upper mesosphere. The green is most likely due to atomic oxygen near 96 km. The red is probably due to hydroxyl (OH) near 87 km. Possibly sodium from near 90 k m also but the orange may also just be the response of the system to the combination of the red and green airglow. The awesome rainbow appearance of the patterns is easily explained. A GW wave propagates upwards at an angle and because airglow layers reside at slightly different altitudes, the waves reach each layer at a slightly different times. The vertical scale size of the gravity waves is also much larger than the height differences between the layers: OH = 87 km | Na = 90 km | O2 = 94 km | OI = 96 km. I exploit the fact of the altitude separation of the four brightest airglow layers in my work to determine the scale sizes and other things associated with the GWs. Sometimes atomic oxygen can also produce red emission. This occurs due times of auroral activity particularly at high latitudes but occasionally in the mid-latitudes during strong aurora. This red-line OI emission, as it is called, originates from 250 km (much higher) in the thermosphere and would not match wave patterns seen in the green-line OI emission. Dr. Steven D. Miller, Senior Research Scientist – Deputy Director Cooperative Institute for Research in the Atmosphere – Colorado State University, have commented the fact that the photos were taken at high altitude and this would probably be the reason why the greens are seen so well, since oxygen in the lower atmosphere will absorb much of that downwelling emission. Dr. Les Cowley, explain in Atmospheric Optics page that red/orange could be yet more oxygen airglow, this time from atoms 150-300km high where the atmosphere is so sparse and collisions so infrequent that the atoms have time to radiate ‘forbidden’ light (1D ->3P) before losing their electronic excitation in impacts with other atoms and molecules. Deep red banded airglow is likely emission from vibrationally excited OH radicals in a layer ~86km high. Blue airglow is much much fainter and not very obvious on the image. Excited molecular oxygen at ~95 km high can produce it. The excitation is indirect. Possible routes are via daylight dissociation of N2 and NO or twilight recombination of NO+ whose reaction products generate excited O2. The oxygen then decays by emitting blue multi-wavelength banded radiation (Herzberg bands) if it is not first collisionally de-excited. After receiving the first results of the Suomi-NPP VIIRS satellite, I decided to start processing another 12 images taken in the same place and time, to create a wide-angle – panoramic view – of more than 200º where it is clearly visible the airglow activity combined with strong ripples from gravity waves occurring in a huge part of the sky from West to Northeast (from left to right on the panoramic image above). At the same time, Dr. Martin Stevák, starts the final stage of processing the images taken by Suomi-NPP VIIRS satellite but in different bands and the result is shown below. These are in Transverse Mercator projection, centered at 38.5N 28W, remapped to 1km pixel size (for Azores). Above – NOAA/NASA Suomi-NPP satellite images taken approx. at 03:05 UTC. 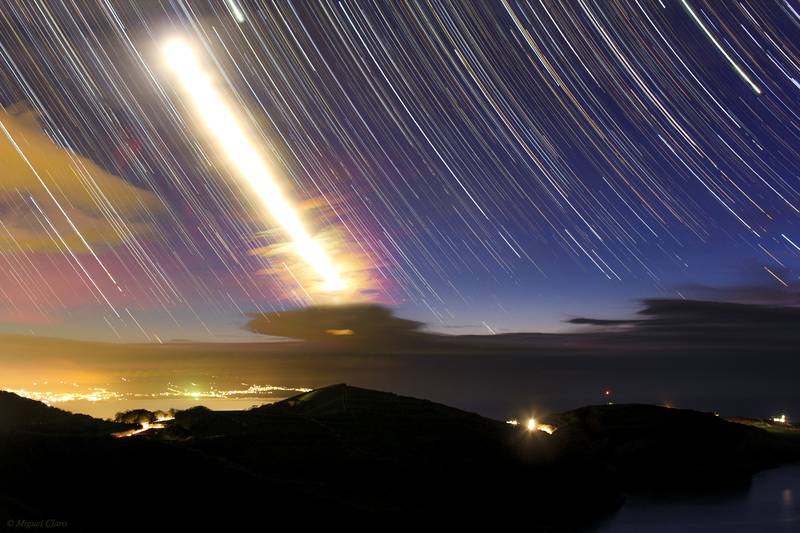 In DNB band, the waves in airglow (nightglow) appear as bands transverse to the jet-stream, passing above the Azores region. To discriminate the airglow waves from cloud formations, it is essential to compare the DNB image with other satellite bands, such as M15 IR band, or even better with more advanced image products, such as Night-Microphysical RGB image. 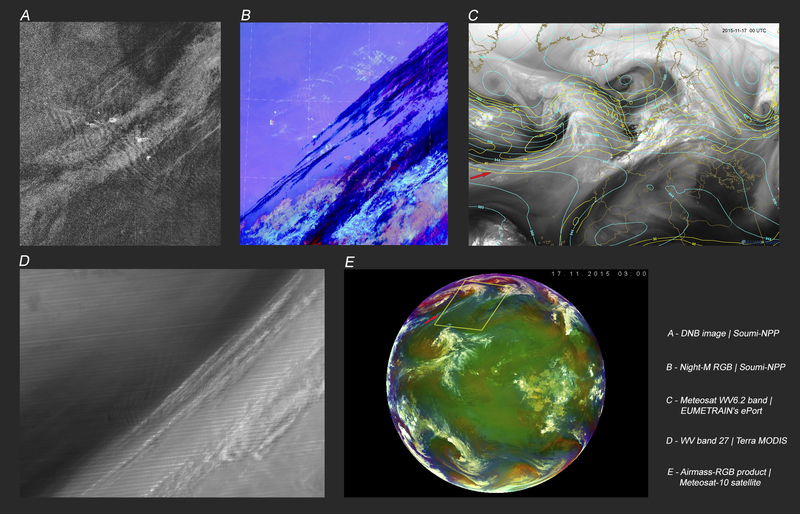 Data: NOAA CLASS archive, processed by Martin Setvák from Satellite Dept. of the Czech Hydrometeorological Institute. Data processing: ENVI, VCTK plugin and Adobe Photoshop CS5. 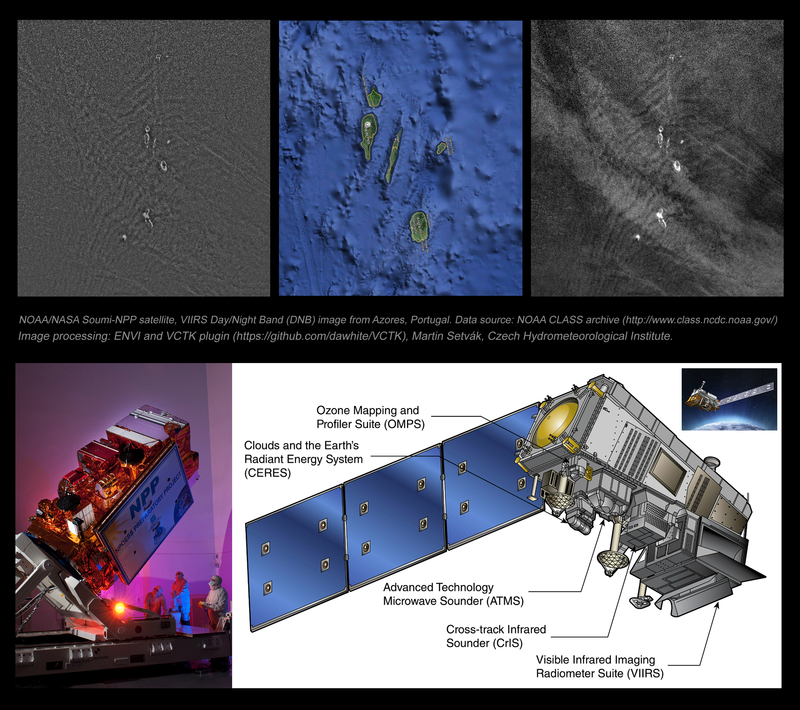 Below, you can see a comparison of images taken by me from Earth, as seen from the island of Pico, Azores (yellow donut on the graphic), versus the images captured by the equipment on board of NOAA/NASA Suomi-NPP satellite, as seen from Space, at approximately the same time. The waves are not matching in the same exact position due to a parallax shift of the airglow waves in the DNB image – in reality waves at this part of the DNB image are located some 100 – 150 km to the east than they appear to be. Below, on (A) we can see the DNB image, that can show the Gravity Waves appearing high in the atmosphere, but on (B) Night-Microphysical RGB image can show a different waves from low atmosphere, they are very likely part of the same spectrum of waves launched by the small island of Flores. 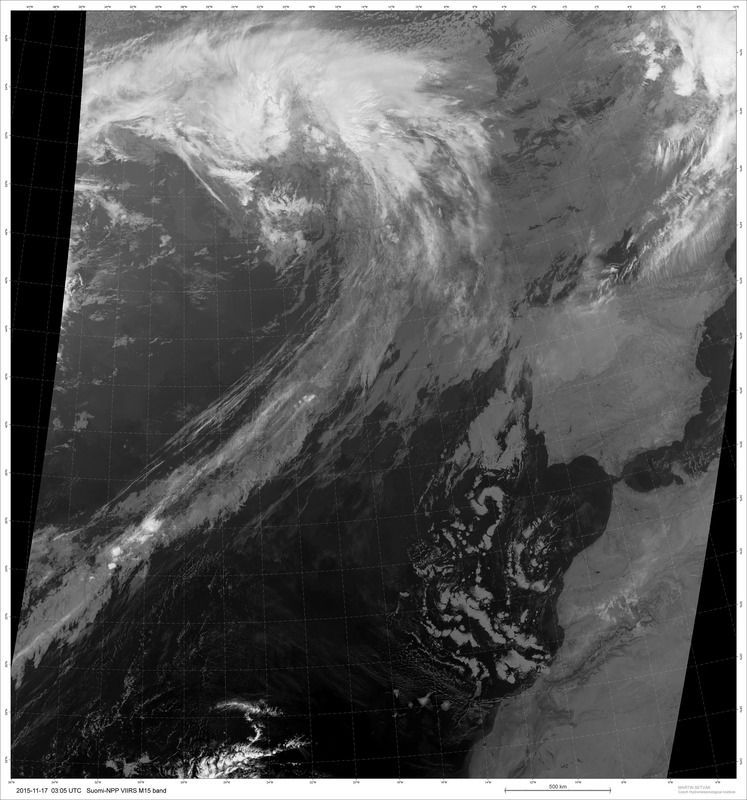 The (C) is an output from EUMETRAIN’s ePort (http://www.eumetrain.org/eport.html), for 2015-11-17 00 UTC, based on Meteosat WV6.2 band and showing the geopotential (“height”) of the 300 hPa pressure level (in cyan) and isotachs (yellow) at the same level (both from the ECMWF model). The red arrow indicates the jet-stream above the Azores. The (D) is the WV band 27 from Terra MODIS satellite taken at 00:20 UTC. The images are in the same projection and pixel size as the Soumi-NPP images (A & B). 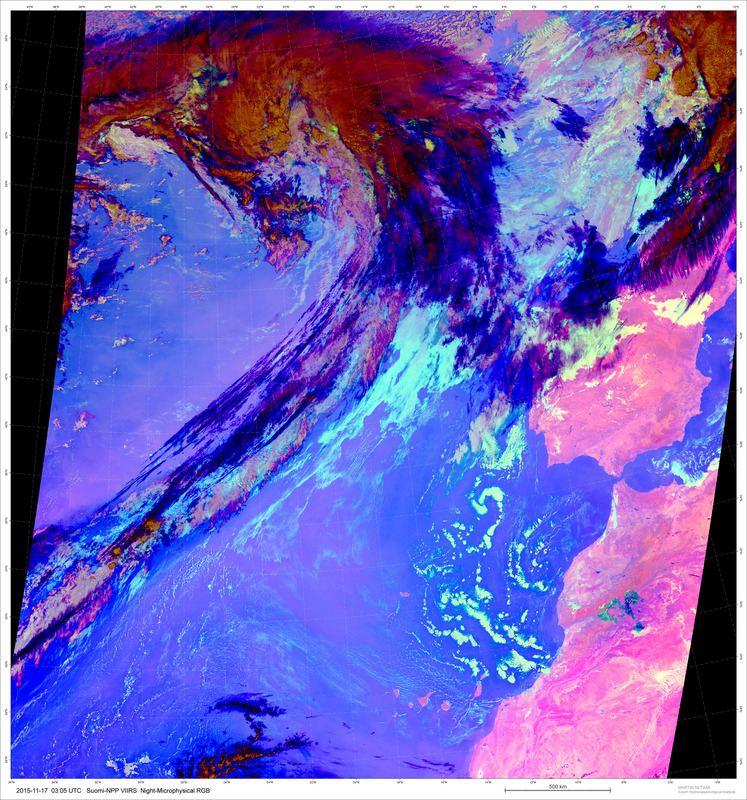 The (E) is a Meteosat-10 satellite in the Airmass-RGB product, documenting the dynamics of the atmosphere in the area, and namely showing the jet stream above Azores, taken at 03:00 UTC, the arrow points to the jet-stream band, and the polygon indicates roughly the area covered by NPP images. To watch a 24h loop from Meteosat-10 satellite, click here. Below is a illustration from a combination of Google Earth Maps from Azores region and Stellarium planetarium software, that can show through the yellow dot, where I was located in the island and which direction my camera was pointing to the sky – as we can see in the illustration at right. Below in gray scale are DNB images captured by Suomi-NPP VIIRS satellite above Pico island, Azores, as a result of a pre-processing enhanced by a High-Pass filter. Taken on 17th November of 2015 at 02h05AM (03h05 GMT. Local time for the Azores is GMT-1,) approximately at same time I took the pictures from Earth between 1h43 and 2h00AM, pointing to the same direction of the sky. Those waves seen at ~2AM local were right overhead at that time. The waves can change rapidly over the course of an hour, so must have been a very expansive wave train, which seems to be consistent with a large-scale forcing like a frontal system. The result shows the ripples of atmospheric Gravity Waves (left and right image). Suomi NPP is in orbit around Earth at 834 kilometers (about 518 miles), well above the nightglow layer. 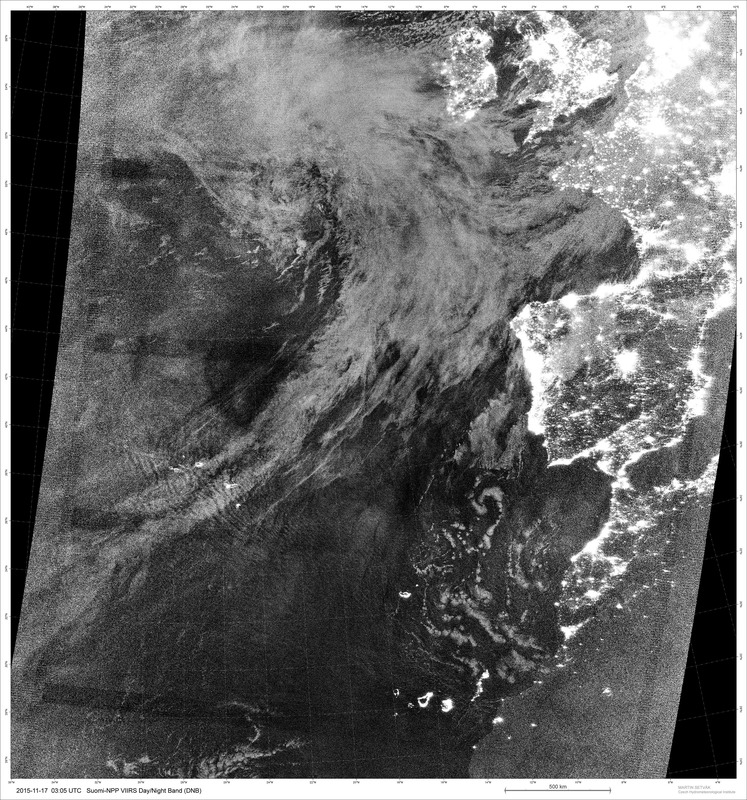 The day-night band imagery contains signals from the upward emission of the nightglow layer and the reflection of the nightglow emissions from clouds and Earth’s surface. While nightglow is a well-known phenomenon, it is not typically considered by meteorological sensors. In fact, scientists were surprised at Suomi NPP’s ability to detect it. During the satellite’s check-out procedures, scientists thought this light source was a problem with the sensor until they realized that they were seeing the faintest light in the darkness of night. Learn more about the VIIRS day-night band and nighttime imaging of Earth in this story: Out of the Blue and Into the Black. The TWAN ( The World at Night ) have now one of the best collection of hight quality images in the world with many different views of Airglow and Gravity Waves phenomenon captured by TWAN photographers spread around the globe, that could be a great scientific tool to help scientists understanding better this atmospheric phenomenon, as seen from different places on Earth and comparing them to the satellite images from Space. 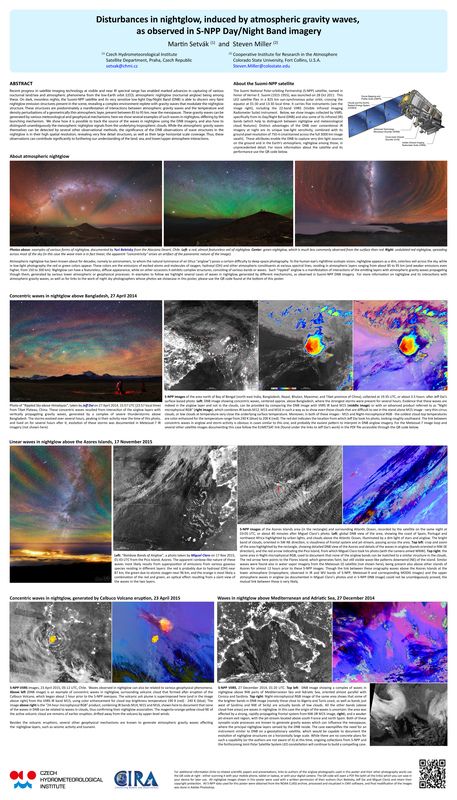 Airglow photographs and compiled text with story by © Miguel Claro – The article was written based in the collected information and collaboration of each specialist and intervenient in different fields of working that have analyzed this images from Pico, and that have been specifically mentioned along the article, now published at (www.miguelclaro.com) with his knowledge and review. Azores is one of the two autonomous regions of Portugal, composed of nine volcanic islands situated in the middle of the Atlantic Ocean. One of the islands is São Miguel, where we can find a beautiful lake in the crater center, called Lake of Fire, “Lagoa do Fogo”. 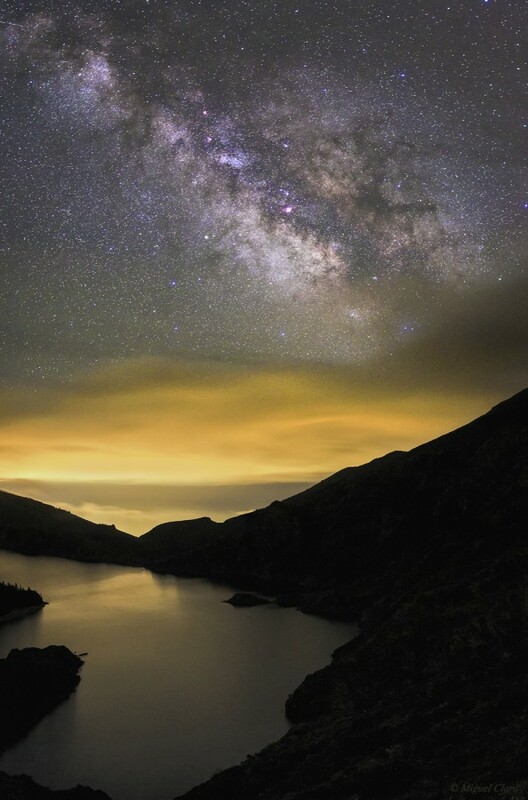 Above it, the sky reveals the magnificent arc of our galaxy, the Milky Way, besides the light pollution coming from Vila Franca do Campo, a small town at the southern shore of the island, that illuminates the clouds near the horizon with the an orange tone. From left to right, we can see the swan (Cygnus) constellation, with its North America nebula (NGC7000) clearly visible below the Deneb star, down to the right, we can find Aquila. Sagittarius is covered by the cloud. 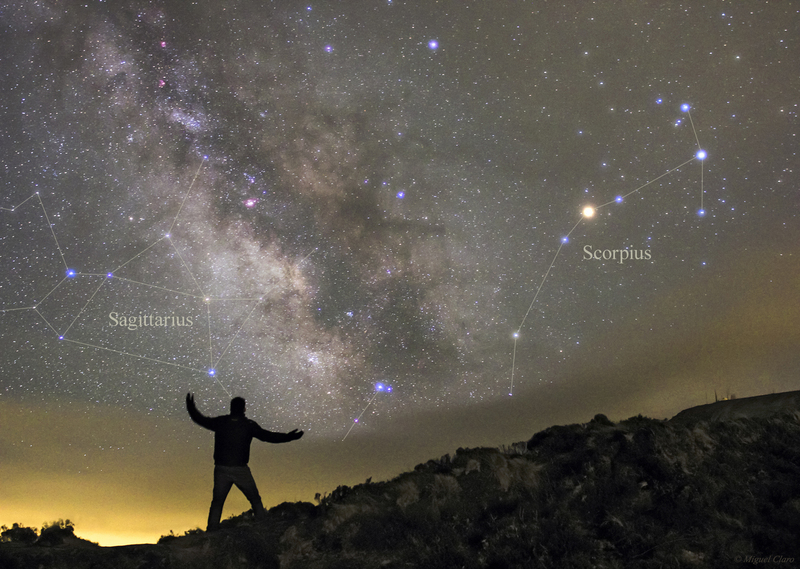 Near the right limit, we find Scorpius and it´s super giant star, Antares, following to the right edge of the picture, it is visible the planet Saturn, in Libra. Canon 60Da – ISO2500; 24mm at f/2; Exp. 20 secs. in 04/05/2014 at 3:45 AM. Mosaic of 21 images. Below is the annotated version. In the real dark nights, the magnificent presence of our home galaxy, the Milky Way, have been a true inspiration for musicians, poets, painters, writers and artists in general. Unfortunately, two thirds of the humankind, have not yet had the opportunity to see the Milky Way with their own eyes, to let fall in love by the beauty and greatness of the Universe around us, making us realize that the Earth is so important as the sky, and our planet has been our spaceship in the life journey through the time and space. In the foreground, we can see the silhouette of a passionate skygazer, embracing the sky like an Atlas Titan from Greek mythology, holding and protecting it from the low cloudy yellow band. Condemned not by Zeus, but by the light pollution created for the entire humanity. 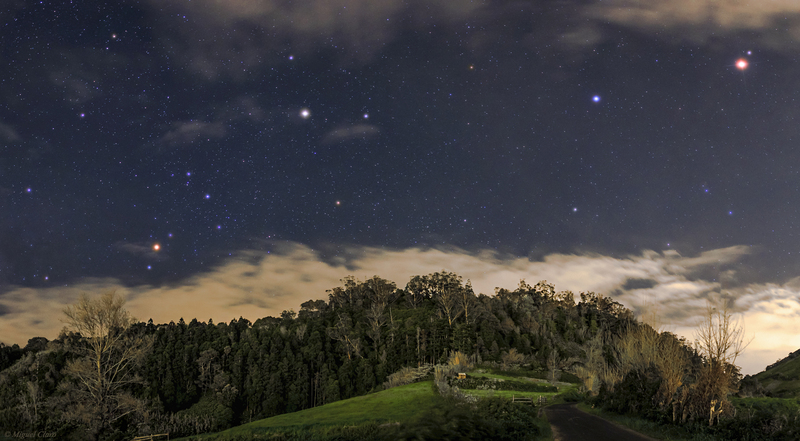 Captured the Lake of Fire moutain hill, in Azores, the background reveals Sagitarrius constellation at left, and Scorpius stars. The great central region of Milky Way, full of nebulae emissions, star clusters, gas and dust, above the cloudy yellow band in the Lake of Fire – Lagoa do Fogo. Doubtlessly, one of the grandest nature attractions of this S. Miguel island, located in the middle of the Atlantic Ocean. This huge blue lake 575 meters above the sea level – it is about 2 km long and 1 km wide – fills the ground of an extinct crater, whose caldera was formed during an eruption in 1563. Surrounded by high mountains and luxuriant endemic vegetation, this mystical lake, surrounded by an ambiance of divine tranquility and beauty, seems to be the perfect scenario – declared as natural reserve- to enjoy a fantastic free open window to our Universe. Canon 60Da – ISO2500; 24mm at f/2; Exp. 20 secs. in 04/05/2014 at 4:30 AM. This short startrail sequence shows the colorful path of main stars from the central region of Milky Way, but also the “blurred trail” of gas and dust from the emissions nebulae in the background, above the cloudy yellow band in the Lake of Fire – Lagoa do Fogo. Doubtlessly, one of the grandest nature attractions of this S. Miguel island, located in the middle of the Atlantic Ocean. This huge blue lake 575 meters above the sea level – it is about 2 km long and 1 km wide – fills the ground of an extinct crater, whose caldera was formed during an eruption in 1563. Canon 60Da – ISO2500; 24mm at f/2; Exp. 20 secs. in 04/05/2014 at 4:20 AM. 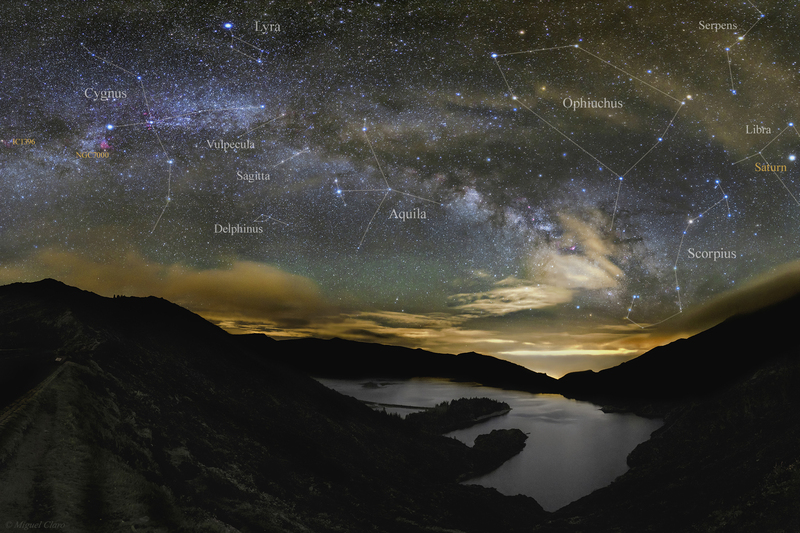 Well known as the “Green Island”, this tipical colorful landscape from Santa Bárbara, in Ribeira Grande, Azores, shows the conection of nature between this rural landscape and the night sky, in this rare oportunity of clear sky, revealing the main stars of Scorpius at left, with the red giant Antares. Above right, in Libra constellation shines an “extra” star, which is actually the bright planet Saturn. At the same aparent altitude, on the right side we can find the blue star Spica, one of the main stars of Virgo constellation. At the right Edge of the picture, the strongest orange/red star, is the light coming from planet Mars. The light pollution reflected on the low clouds, coming from Ribeira Grande city, in the the opposite direction, was enough the light up all the green landscape. Canon 60Da – ISO1600; 24mm at f/2; Exp. 15 secs. in 03/05/2014 at 2:39 AM. Below is the annotated version. 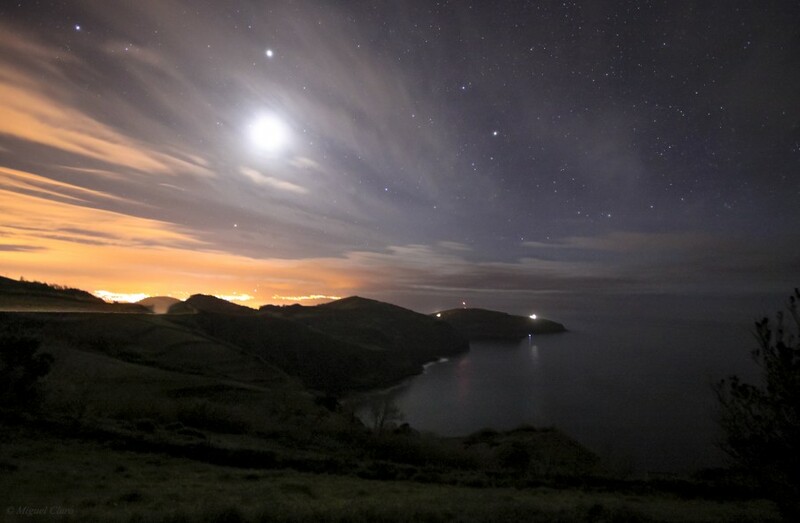 In this Moonlight scene captured in Miradouro de Santa Iria, Azores, facing to west , the moon is bright enough to light up the green mountain hill and the Atlantic Ocean. Between the clear and cloudy sky we can find in the left corner, the star Procyon, next and above the moon, shines the light of planet Jupiter. In the center is visible Capella star. Above the horizon the light pollution are coming from Ribeira Grande, as well from Lagoa and Ponta Delgada. Azores, is one of the two autonomous regions of Portugal, composed of nine volcanic islands situated in the North Atlantic Ocean, is located about 1,360 km west of continental Portugal, about 880 km (550 mi) northwest of Madeira, and about 1,925 km southeast of Newfoundland.There are nine major Azorean islands and an islet cluster, in three main groups. These are Flores and Corvo, to the west; Graciosa, Terceira, São Jorge, Pico, and Faial in the centre; and São Miguel, Santa Maria, and the Formigas Reef to the east. They extend for more than 600 km and lie in a northwest-southeast direction. 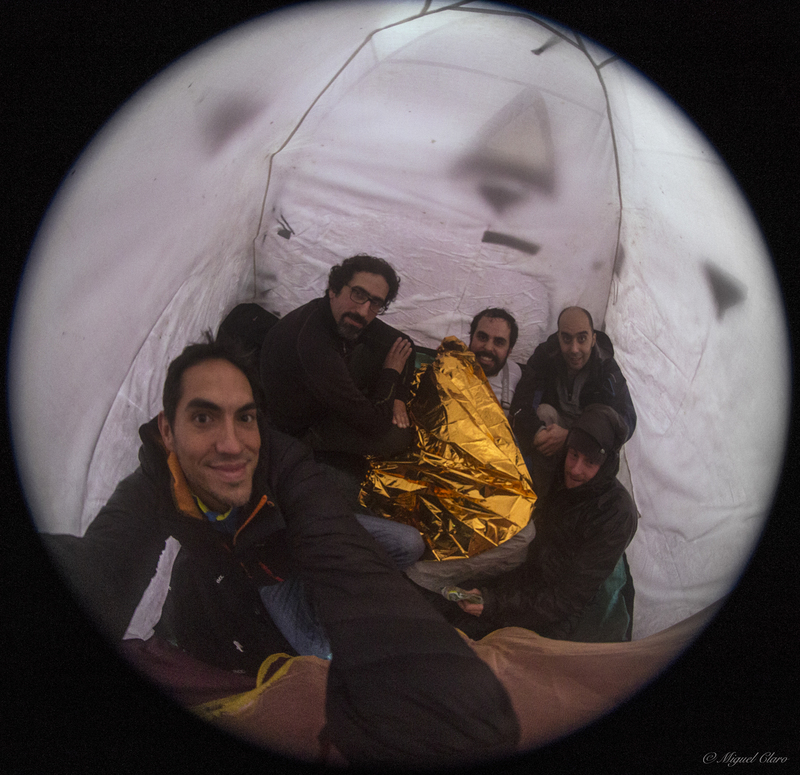 Canon 50D – ISO1600; 10mm at f/4; Exp. 55 secs. in 03/05/2014 at 23:25. Captured with Travel Mount Vixen Polarie. There are milions of sky enthusiasts and amateur astronomers in the entire world, fighting against the growing problem of light pollution and trying to find some dark places that could revealing more stars as well, the beautiful presence of Milky Way. 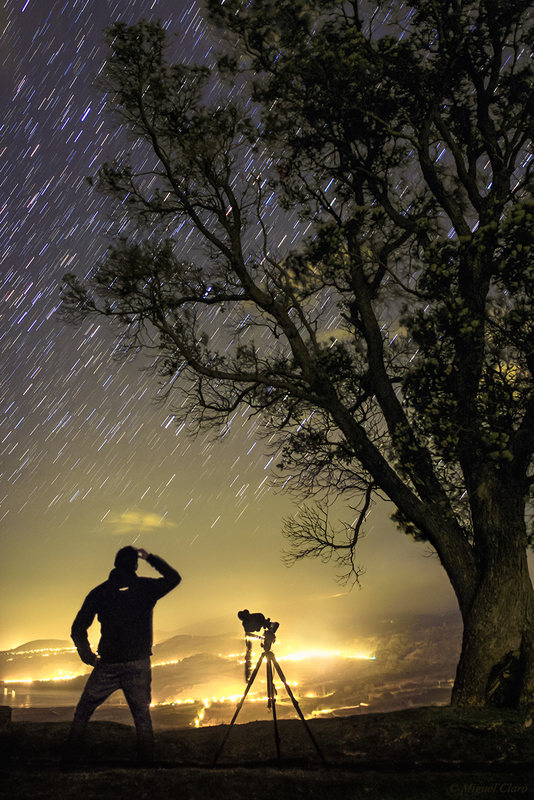 Skygazing is more then a passion…becoming a life style. 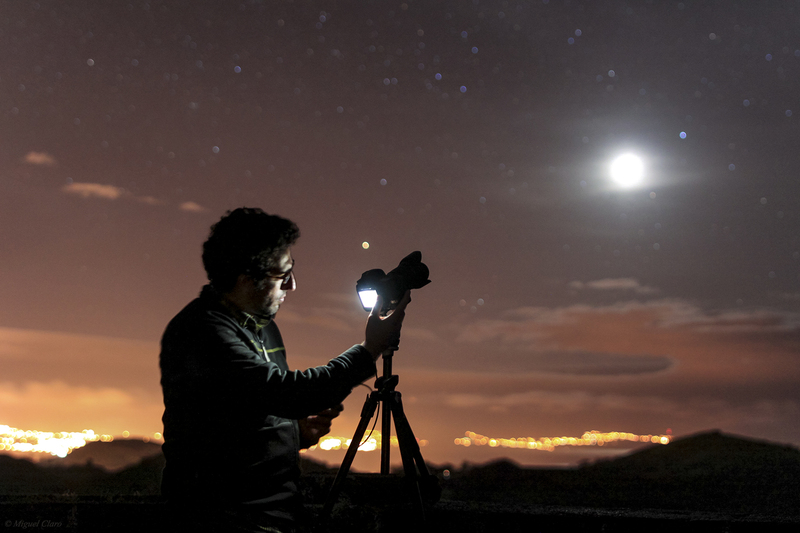 The image were captured in Miradouro de Santa Iria, S. Miguel, Azores, facing to East, where the lights from Porto Formoso e São Brás, are even stronger. Canon 60Da – ISO1250; 24mm at f/4; Exp. 20 secs. in 03/05/2014 at 00:44 AM. In this full star/moon trail, we can see the different colors from each type of star. 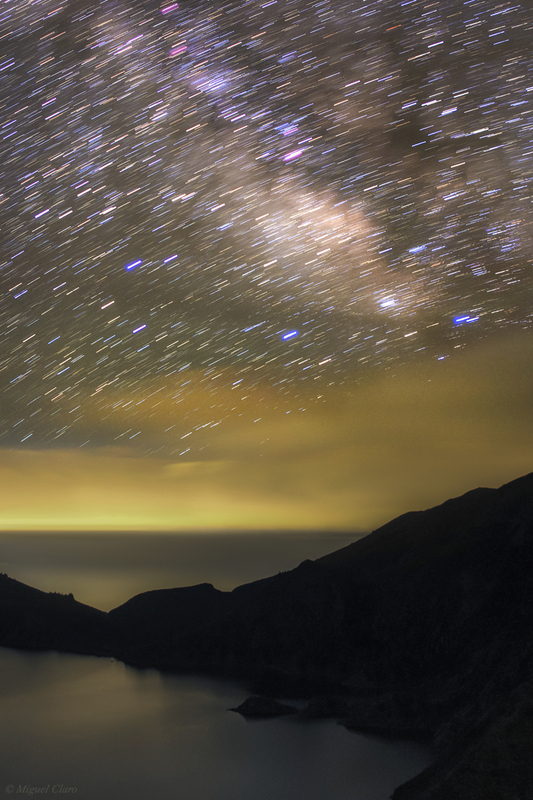 This scene captured in Miradouro de Santa Iria – Azores, shows a long exposure (integration) starting at the nautical twilgiht until the moonset behind a the cloudy sky, reflecting the light pollution coming from Ribeira Grande, as well from Lagoa and Ponta Delgada. The strong small path near the moon in the top edge of the image, belongs to planet Jupiter. The vast extent of the islands defines an immense exclusive economic zone of 1,100,000 km2 (420,000 sq mi). The westernmost point of this area is 3,380 km (2,100 mi) from the North American continent. All the islands have volcanic origins, although some, such as Santa Maria, have had no recorded activity since the islands were settled. Mount Pico, on the island of Pico, is the highest point in Portugal, at 2,351 m. The Azores are actually some of the tallest mountains on the planet, measured from their base at the bottom of the ocean to their peaks, which thrust high above the surface of the Atlantic. Canon 60Da – ISO1000; 24mm at f/2.8; Exp. 15 secs. in 02/05/2014. Sum of 314 images taken between 22:47 and 00:17 AM. Total time integration of 79 minutes. Lagoa das Sete Cidade (English: Lake of the Seven Cities) is a twin-lake situated in the crater of a massive crater on the Portuguese archipelago of the Azores. It consists of two ecologically-different small-lakes connected by a narrow passage (and crossed by a bridge), located inside a dormant volcano on the western third of the island of São Miguel. The Lagoa das Sete Cidades part of a natural landscape of communitarian interest: it is the largest body of water in the region and one of the most important freshwater resources in the archipelago. More info click here. This place have a peculiar weather and we could see in this image taken at a deep night with a long exposure, a strange cloud formation that is around the volcano crater as well as all the light pollution reflected in the clouds, from the small village that exists in the center of the crater. The air planes normally avoid to fly above it. Canon 50D – ISO800 F/4 180sec. 10mm in 4/12/2011 at 02h40 | Panoramic picture, composed by 3 images taken at deep night around 02h40, in a long exposure of 3 minutes for each photo.